Will Jude Law's Dumbledore be openly gay? 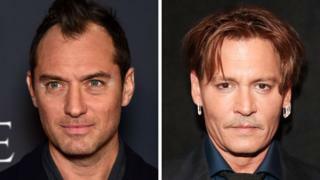 Image caption Will there be a romance on screen in Fantastic Beasts 2 between Jude Law and Johnny Depp? The news that Jude Law is to play a young Dumbledore in the sequel to Fantastic Beasts and Where To Find Them has led to speculation over the direction of the movie - and whether his character will be openly gay. It's 10 years since JK Rowling revealed that Hogwarts headmaster Albus Dumbledore was gay in a Q&A with fans. It confirmed speculation that had been around on fan sites for years - all that was known before that was that he had a mysterious, troubled past. Rowling also revealed that when he was young, Dumbledore had been smitten with rival Gellert Grindelwald, who he beat in a duel. Dumbledore was "horribly, terribly let down" she said, and his love for Grindelwald was his "great tragedy". We already know Johnny Depp will play Grindelwald in the movie, so many fans are hoping to see Depp and Law in an on-screen romance. Some LGBT fans were upset that JK Rowling didn't mention in any of the books that Dumbledore was gay and saw it as an "afterthought". In a blog post on the Harry Potter fan site Mugglenet.com, Elayna Mae Darcy says the upcoming Fantastic Beasts film is a chance to put that right. "One has to have hope that she will use this opportunity to show us the side of Dumbledore we could never have seen when he was a much older man who had long before been tragically let down by the man he loved," she writes. "We have the chance to witness, in real time, a Dumbledore who is young and vivacious and who, hopefully, both acknowledges his sexuality and gives us a chance to see a well-rounded gay character in a mainstream blockbuster." She says the Harry Potter author has a responsibility to show the relationship. "Representation can change people's lives and make them feel seen... Kids growing up right now have a chance to experience one of the most important characters in the entire saga as someone who's confident with who he is." And she is backed by other fans, who do not want to see Dumbledore's sexuality glossed over. Speaking last year about the second Fantastic Beasts movie, Rowling said we will see Dumbledore as a younger and "quite troubled man". "We'll see him at that formative period of his life. As far as his sexuality is concerned, watch this space," she said. But Debbie Moon, Bafta-winning writer of the fantasy series Wolfblood, isn't convinced we'll see any romance on screen. "Chances on Young Dumbledore appearing even remotely gay in a major studio tentpole? I'll take 0%..."she tweeted. And some fans have pointed out that any gay storyline may cause problems for the film's distribution worldwide. The live action Beauty and the Beast, which featured the first openly gay character in a Disney film, was recently pulled from Kuwait cinemas and faced issues in Malaysia, where homosexual activity is illegal. Russia's Culture Ministry allowed the release of Beauty and the Beast - but children under the age of 16 are not allowed to see it. It was given a 16+ age rating after a Russian MP petitioned Culture Minister Vladimir Medinsky to ban it because of the inclusion of a gay character. When pressed on Dumbledore being gay in the second film, Rowling pointed out that is only the second film in a series. "I would like to say because this is obviously a five-part story, there's lots to unpack in that relationship." So fans may have to wait to watch the love story and ultimate betrayal unfold.